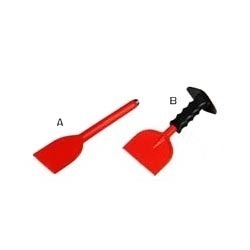 - Sizes: 2", 3", 4"
Owing to our expertise in this domain, we are providing Brick Bolster Chisel. Our range of brick bolster chisel is designed using top quality factor inputs and modern techniques. We provide this brick bolster chisel in numerous specifications to meet ever-evolving needs of our patrons. We are offering Brick Bolster Chisel to our lient. We are the leading company manufacturing a wide range of Bolster. Made from Carbon Steel. Duly Hardened & Tempered. Heavy Rubber Grip Sleeve. Masonry chisels are typically heavy, with a relatively dull head that wedges and breaks, rather than cuts. The chisel is held with one hand and struck with a hammer. The direction of the taper in the blade determines if the chisel cuts deep or runs shallow along the joint. Our range of brick bolsters, model – ST-138, is devised from superior quality carbon steel, that is duly hardened and tempered. 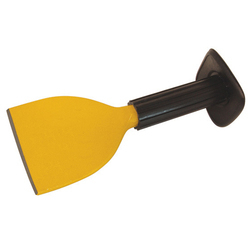 These brick bolsters are available with or without a grip. Features:· Drop forged carbon steel.· Having cutting edge hardened and tempered for long lasting performance.· Corrosion resistant, highly efficient and durable.· Available with or without grip.